The front cover a contemporary Kenyan E-passport. 34 Pages Ordinary "A" Series Kshs. 4550. 50 pages Ordinary "B" Series Kshs. 6050. 66 Pages Ordinary "C" Series kshs.7550. East African passport ksh.990. Mutilated Passport Kshs 10,050. Lost Passport Kshs 12,050. As of September 2017, Kenya commenced issuing the new East African format ePassport. Directorate of Immigration and Registration of Persons, Gordon Kihalangwa, said on a live Twitter chat that tracking individuals’ movements will become easier with the ePassport. This is inline with digitization of Kenya. The new e-systems will improve efficiency and rid out loop holes and enhance security this one of Kenya's goal in vision 2030. The new bio-metric passport contains the holders bio-data such as finger prints, digitally stored photo and signature among others. –Security features to prevent unauthorized use and forgery. –Details of the ePassport will be registered with the International Civil Aviation Organization (ICAO). Also to be noted is that the new color adopted on the Kenyan ordinary passport, Light blue are the official colors of the East African community. The new ePassport will be available as of 1 September 2017. The old ordinary passport will be phased out by 31 August 2019 and they will be rendered unusable and cease to being recognized as travel documents. Holders of existing old format passports are strongly advised to apply for the new ePassport before this date. All new passport applications are processed via the Kenya Government E-citizen portal https://immigration.ecitizen.go.ke/index.php?id=4. According to the department of immigration under ministry of interior and National coordination, and read together with the Kenyan constitution. Kenyan passports are valid for ten (10) years after date of issuance. Also to be noted is, children and persons under eighteen (18) years are required to have their own government issued passport separate from the parent. Minors application is done on the parents e-citizen account and clearly one selects "minor application". Fees are the same as for adults and validity is also ten (10) years. The Kenyan passport is valid in all Commonwealth countries and all foreign nations of the world. East African Community Passports are issued and replaced by the competent authorities in East African partner States or the Diplomatic Mission abroad. This passport is valid for 10 years from the date of issue unless otherwise stated. If at any time a passport contains no further space for visas or in the case of significant changes in the facial appearance owing to age, medical condition, or any other reason a new passport must e obtained. Kenya has two official languages, English and Swahili, and in all government and legal documents both languages are used. In the Kenyan passport, French is also used. -Diplomatic (maroon cover): Issuable to Kenyan diplomats accredited overseas and their eligible dependents and to citizens who reside in the foreign country. valid for six months and usable for multiple entry into: Tanzania, Uganda, Rwanda, and Burundi. Kenyan passports have the Kenyan coat of arms emblazoned in gold in the center of the front cover. The words "EAST AFRICAN COMMUNITY” are inscribed at the top followed by "REPUBLIC OF KENYA" is inscribed in gold text above the coat of arms, while "PASSPORT" is inscribed in gold text below it. The back cover is left blank. The passport note occupies the second page of the passport, and the emergency contact information is on the last page. The identity information page is printed on the inside of the passport's second page, while the person's description are on the third page. 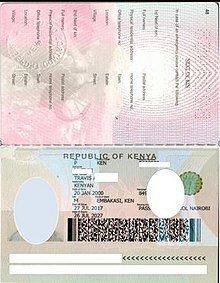 The pages of Kenyan passports are watermarked with the Kenyan coat of arms. The pages feature designs with the 'big five game' animals commonly found in Kenyan national parks and reserves: the lion, elephant, leopard, rhino and Buffalo. These are to request and require in the Name of the president of the republic of Kenya all those whom it may concern to allow the bearer of this pass freely without let or hinderance and to afford the bearer such assistance and protection as may be necessary. Hii ni kuwaomba na kuwasihi, kwa jina la Rais wa Jamhuri ya Kenya, wote wanohusika, kwa kusudi la kumruhusu mwenye pasi hii kupita bila kizuizi ama kipingamzi chochote na vile vile kumpa msaada na ulinzi wowote ambao utakaoonekana kuwa wa lazima. Au nom de Son Excellence Monsieur le President de la République de Kenya, nous vous de bien vouloir laisser librement circuler le titulaire de ce passeport et lui prêter main forte et protection en cas de nécessité. -The words "Republic of Kenya" written in English, Swahili and French. -Reference number or known as file number. The page ends with a two line machine readable zone, according to ICAO standard 9303. Also the holder's National ID card number. There is also a holographic 3D copy of the owners picture, Holographic copy of the two machine readable lines Security features seen under special UV light. Holographic micro printing and kinematic elements. 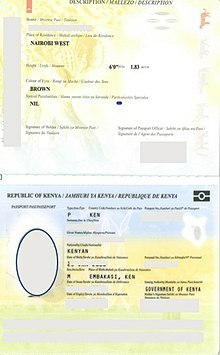 Documentary evidence of Kenyan citizenship in the form of a birth certificate and national identity card, plus details and identity card of parent(s). In case of previous citizenship to another country, a Certificate of Naturalization or Registration. Photocopy of the recommender's valid Kenya national identity card-who signed on page 3, section 7 of the application form. Parents' or legal guardians' written consent, in the case of an applicant who is below the age of eighteen years. Special cases: Lost, mutilated, damaged passport. Application for replacement of any must be accompanied by a statutory declaration or sworn affidavit on the circumstances surrounding the loss, theft or damage of the passport or travel document. And be accompanied by their Identification card and birth certificate. -Two copies of proof of previous Kenyan citizenship (copy of passport, Birth certificate, Kenya National ID card). -Two copies of proof of the other country's citizenship. Two copies of Form 5 "regain citizenship form" and attach the following. Two copies of either: Kenyan passport, Kenya national ID card or birth certificate. Two copies of proof of the other country of citizenship. As of February 2018, Kenyan citizens had visa-free or visa on arrival access to 72 countries and territories, ranking the Kenyan passport 67 in terms of travel freedom (tied with Omani passport) according to the Visa restriction index. ^ "The East African Passport". www.eac.int. East African Community. Retrieved 1 December 2014. ^ "Passport Application". eCitizen Portal. eCitizen. Retrieved 12 March 2017.